If variety is the spice of life, then April 6’s Live from Here is the tandoori masala of Dallas’s spring arts events! Between the four featured artists, the program is sure to touch nearly every emotion. With Chris Thile’s lilting voice, and equal parts accessible and virtuosic performances weaved throughout the show, the evening is not to be missed! The Head and the Heart’s self-titled breakout debut produced a number of well-known hits including “Rivers and Roads,” “Down In The Valley” and “Lost In My Mind,” providing the background music for some of primetime’s most stirring moments in Chuck, How I Met Your Mother, Sons of Anarchy, The Good Doctor and New Girl. They have toured immensely with stops at Coachella, Red Rocks, Hinterland Music Festival and Lollapalooza and performances on Ellen, The Tonight Show with Jimmy Fallon, Austin City Limits and more. This May they will be releasing their 4th full-length album, Living Mirage. Jamie Lee hails from our own great city of Dallas and attended UT Austin before breaking into the comedy scene. She has appeared as a stand-up comedian on Late Night with Conan O’Brien, The Late Late Show with James Corden, Last Call with Carson Daly, and Chelsea Lately. Her book Weddiculous: An Unfiltered Guide to Being a Bride was named #1 on Bustle Magazine’s list of best wedding books and in 2017 Elle Magazine named her as one of the top 11 comedians to watch. In 2018, she was the female lead on the second season of the HBO series Crashing, for which she was a writer on the first season. After McInerny’s husband was diagnosed with a serious form of brain cancer, Nora began documenting her experiences on the blog My Husband’s Tumor. Prior to his death, together, they wrote his now-viral obituary. Since his passing, she began a group for young widows, started the nonprofit Still Kickin’, penned the book It’s Okay to Laugh: (Crying is Cool Too), and created the podcast Terrible, Thanks for Asking. In March 2019 she released her sophomore book, No Happy Endings in which she writes about the aftermath of an extraordinary loss and the absurdity of the idea that you’ll ever be completely healed. 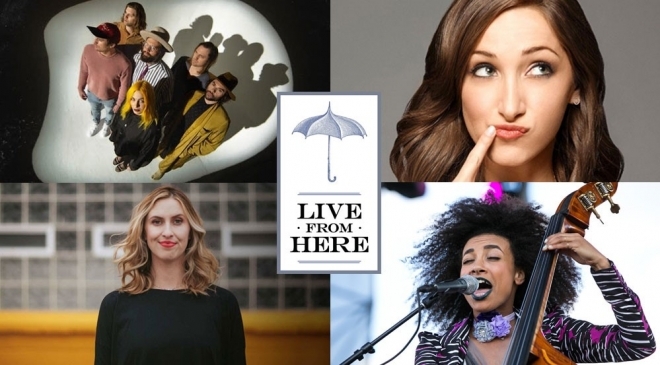 Tickets for Live from Here begin at $49 and are available here.